Is your DMI Score Healthy? 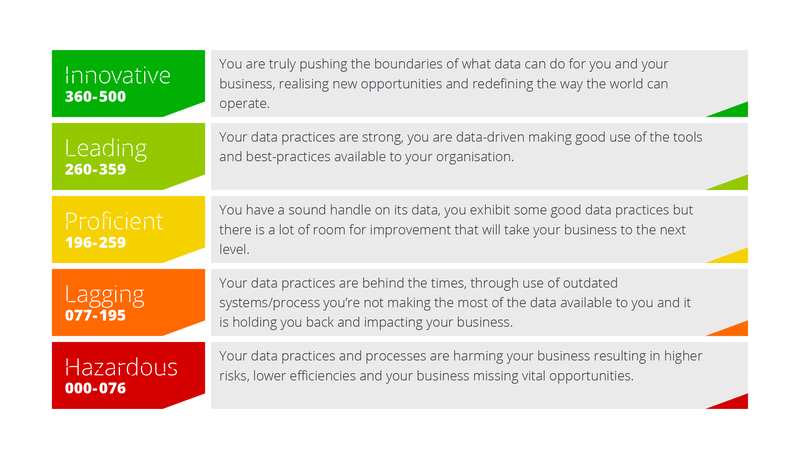 Data maturity is how well your organisation maximises the value of its data. Incremental's Data Maturity Assessment is a structured analytical approach to objectively measure your organisation's data maturity and provide you with your DMI (Data Maturity Index) Score. Your DMI Score will provide you with a detailed 360-degree insight into the health of your data, your readiness to utilise this data and ability to drive digital transformation throughout your organisation. Your Data Maturity Assessment will be led by one of our experienced Data Engineers. All of our Data & AI team are fully qualified in our data maturity assessment framework and have helped a wide range of organisations improve their data quality, reporting and optimisation. Preparation call – Initial call to explain the assessment in more detail, book your workshop slot and answer any questions you may have. Comprehensive health check questionnaire – Incremental will send you a detailed list of questions, broken into several categories, for you to answer within 2 weeks. We recommend you gather information from multiple stakeholders throughout your organisation when undertaking this task so that your answers provide an accurate and holistic view of the current state of your data. Deep dive workshop – In a half-day workshop, your lead Data Engineer along with another member of our Data & AI team will review and discuss your questionnaire answers. This deep dive will enable the team to undertake a full analysis of the health of your data across the various sections of our data maturity framework. Report and recommendations – Within 2 weeks of your workshop Incremental will provide you with your detailed data maturity report and a visual dashboard of our findings. This report will include your DMI Score along with a breakdown on where you are performing well or poorly (ranked on a numbered scale of hazardous to innovative). The report will also provide a comprehensive list of recommendations of how to improve your DMI Score, from quick fixes to more substantial digital transformation projects. Enquire about undertaking our Data Maturity Assessment below. After submission, we will be in contact to arrange your preparation call and answer any questions you might have prior to beginning the project.